This morning I discovered that I share the planet with some chucklehead who believes people should hang their shoes on the wall. Hang their shoes. On the wall. 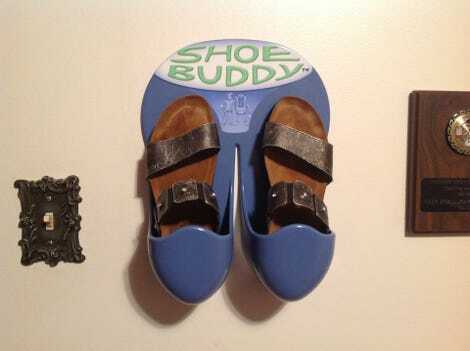 This is the Shoe Buddy, a product that solves a problem nobody actually has. Also, the website is bad. Like, really, really bad. ...and certain keywords in this repeated, obnoxious message are jamming up my workspace. We get it dude, you have a problem with weed, but this behavior isn’t going to get you anywhere. Seriously, I’ve been alive for damn near 50 years now, have lived in five different states and on both sides of the country, and can think of no one, literally no one, who would ever want to do this with their shoes. With that, Shoe Buddy wins the World’s Dumbest Product award, forever.